Northland Sea Kayaking is located on one of the most pristine and beautiful coastlines in the world, encompassing Whangaroa Bay and harbor to the north, the Cavalli Islands just to the south, and continuing on down to the famous Bay of Islands. 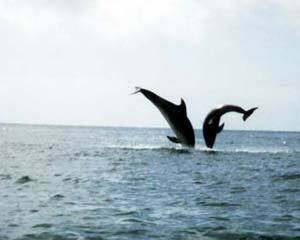 Dolphins frolic regularly in the waters of Northland . The premiere sea kayaking experience available is a rare opportunity to explore a dynamic, and convoluted section of mainland coast and islands, with a multitude of sea life literally at your arms length. In your environmentally friendly kayak, you'll be amazed at what you can encounter. These coastal waters are home to dolphins, orca, pilot whales, penguins, fur seals, stingrays and a abundance of fish life (sea food lovers take note!) a large variety of sea birds and even the occasional green sea turtle.